I got so many recommendations of places to eat during my week at the beach, but I ended up grilling out at the house for the most part. Just hanging out on the back deck with my dog, my friends and some amazing ingredients was hard to leave. 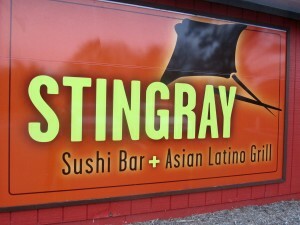 Saturday night, we biked into Rehoboth Beach for a cocktails and sushi at Stingray Sushi Bar + Asian Latino Grill. I loved the cute Victorian house and front porch setting at Stingray, but when you enter, prepare for trendy decor and music. We sat at the bar, had too many cocktails, and split sushi rolls and ceviche. My fave: the black grouper ceviche! From there, we biked back to the boardwalk where we took in an epic Journey cover band... if that doesn't get you in beach vacation mode, I'm not sure what will! Maybe all of those veggies made me crave something bad for me? I mean, Orange Crushes aren't terrible for you on their own... perhaps it was that I had more than I recall. They do go down easy and The Starboard serves more oranges (and grapefruit) than any other establishment in Delaware. It involved a cover band. Possibly shots. And making fun of a guy that couldn't stop saying that he had a Lamborghini. And, lots of fun with Mary & McCealaig. Let's put it this way - the nachos served three grown adults who are big eaters... and we were too full to order lunch. Add it to your list if you just need a mound of cheesy goodness. For the big day, we decided to return to Stingray for drinks and then walk across the street to Zebra for some Italian. Of course, I tasted everyone's plates, so I can confirm that my favorites were the carpaccio, the grilled avocado with mango, and the summer risotto. With the week over, it was time to turn in the keys (*tear*). Luckily, right next to my realtor was my favorite coffee shop - I picked up a spinach and cheese stuffed croissant, an iced latte and got ready to fight the traffic back home to DC. I like to think the Coffee Mill makes entry and exit to Rehoboth and Dewey (it's at the apex) a little bit nicer. 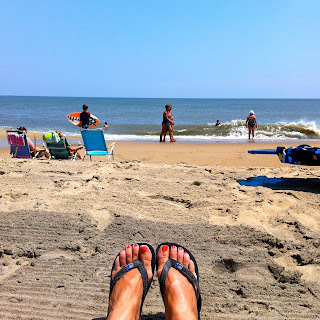 The always in-the-know Cathy Barrow clued me into the fact that Dewey is a dog-friendly beach, so that made narrowing the scope of last minute rentals easier. I picked a house (100 West) that was just a block from the beach, bike-able/long-walkable to Rehoboth, had three bedrooms to host friends and a fenced in backyard for Ike. It was perfect. Long & Foster made the rental super easy and I'd definitely recommend reaching out to Carol there if you are looking for a place. I know I'll be back.